There are a lot of skin issues that afflict animals that causing inflammation, pain and minor bacterial infection. The majority of prescription sprays contain powerful steroids. 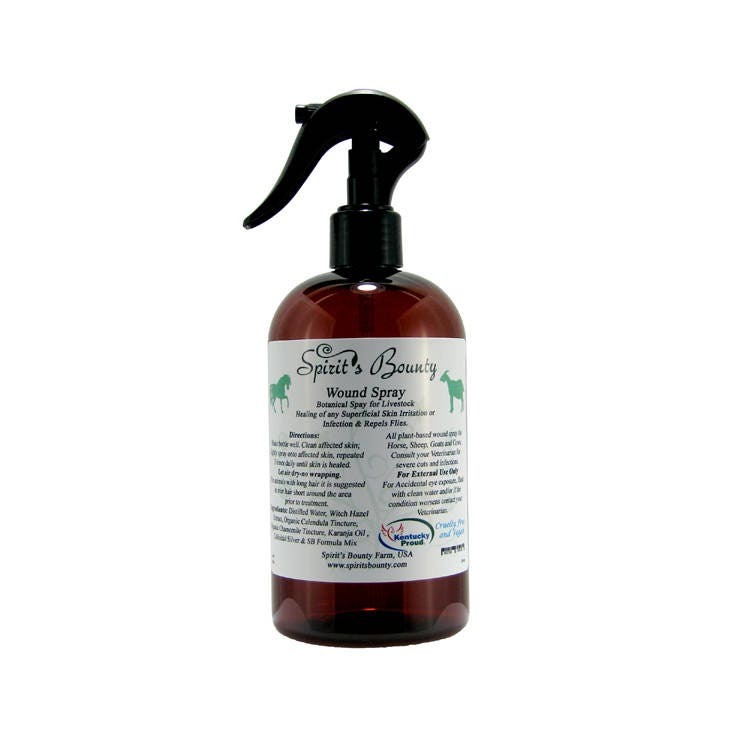 The veterinarian at Spirit’s Bounty Farm has formulated an effective, soothing spray made from plant extracts and other natural components that fight minor infections, calms itchy, irritated skin without the immune suppression of steroids and repels flies. This product is not intended to diagnose or treat any disease. Spirit’s Bounty Farm Botanical Wound Spay for Livestock contains: Distilled Water, Witch Hazel Extract, Organic Calendula Tincture, Organic Chamomile Tincture, Karanja Oil , Colloidal Silver & SB Formula Mix.